Grandkids help keep Alzheimers at bay. Or not. This just in from an Australian study reported in the journal Menopause: Since everyone knows that keeping mentally alert and socially engaged are plus factors in staving off dementia, a team of scientists decided to look at whether or not caring for grandchildren made a difference in the health of post-menopausal women. After all, they reasoned, that caretaking was something that lots of p.m. women do. Why not factor it in? The good news is that women who care for their grandchildren one day a week had better cognition and less dementia. 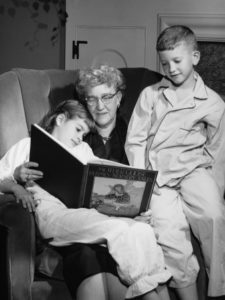 The bad news is that women who care for their grandchildren five days or more a week did significantly worse on the test that measures working memory and mental processing speed. The researchers thought that this might be linked to the fact that the women who were clocking the heavy caretaking hours felt that their children were more demanding of them. (No kidding!) Maybe the family tension contributed to the negative part of the equation. Is this like the finding that drinking a glass of red wine is good for your health? More study needed, obviously.